Ballantyneâs accusation stems from the decisions of the local organisation in relation to awards for the various area road races. The various road races held in the communities weekly cater for athletes who reside in these communities and their environs, with awards given to those who place on top. But, Ballantyne differs, as he believes that instead prizes should be awarded to persons from the community, as well as others from outside in an open category. Ballantyne believes this move is geared towards preventing him from participating. Instead, he proffers that with him competing in the area races, it would add to the competition, as others will endeavour to beat him. âBut I am not the problem, the problem is the rewards….Once you increase the prizes, they will get people to come out and runâ¦ People these days not running for nothingâ¦ People need cash incentive,â Ballantyne underscored. âI ran in the Keartons to Layou race last Sunday and came first and they did not even acknowledge me that I won the race â¦They are taking away my rights and my freedomâ¦ I am not speaking on me behalf only, but for the others athletes,â he added. Ballantyne is also peeved with the reward of medals given to the top places in these races. 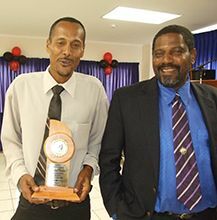 âSuccess is very expensive â¦ A medalâ¦ A man in the street can give you a medalâ¦ Can you go to the supermarket and pay for supplements and buy grocery with a medal?â Ballantyne told SEARCHLIGHT in disgust last Wednesday. SEARCHLIGHT was informed that the reasoning behind the area races is to build athletes from these locales who will garner the confidence to venture out into the other established races. It was also made known to this publication that it was established that persons who reside outside the communities where the races are held, would do so as guests, but are not guaranteed prizes. This is just one of the other changes made to the 2014 calendar, as outlined by general secretary of Team Athletics SVG Tyrone James in an email announcing this yearâs events. Team Athletics SVG will this Sunday stage the four-leg NACAC/OECS invitational Road Relay through the streets of Kingstown from 3 p.m. The top finisher in the international/regional category gets US$1,000; second place – $700 with the third gaining $500 and the fourth place $300. The prizes in the primary school category see the winner gaining $300, the second place $200 and the third place $150. Meanwhile, the winner of the secondary schoolsâ category gets $400, with $300 allocated for the second place and $200 for the third place.